July 2009. Mom still knows me. February 2011. She knows me not. You may be reading this now because someone you love dearly has dementia or Alzheimer’s. In my case, it’s my mom. My mother always prided herself in her intellectual abilities. She had her Master’s Degree and enjoyed academia and arguing everything from politics to poetry. Two major strokes in 2006 and 2008 have changed all that. Damage to both frontal lobes of her brain left her severely demented, similar to a two-year old as far as reasoning and judgment and completely lacking any cognitive functioning. Okay, to break it down to where we live, my mom was eating napkins, fake fruit and wearing diapers…once she wore them OVER her pants because my brother let her dress herself. She could still walk and LOOK like a normal, pleasant little old lady. But the mother we knew was gone and there was no bringing her back. As she recovered from the last stroke in September 2008, they moved her to “rehab” in NY but it was a very poorly run nursing home where we discovered our mom strapped in a wheel chair with food down her face and shirt, sitting in a wet diaper that had soaked through her pants. “Rehab” was being left for ten minutes on a bike she could not operate while an over-stretched physical therapist tried to tend to several other broken people at the same time. We made a decision to break her free and I took her home with me to Rhode Island with hopes of helping her to at least regain her ability to walk. 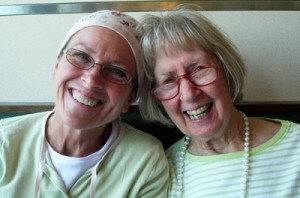 One week later I received the news that I had breast cancer. Despite looking ahead towards a winter of surgery and chemo, then radiation in the spring, I decided to keep her. Although she was blissfully ignorant of my condition, I still wanted my mom. And as I tucked her in every night and saw the child-like expression of love on her face, I knew I had made the right decision. It was hard, sometimes painfully hard, caring for my mom like she was a child but still respecting her as my 80 year old mother. And at times my patience reached beyond frustration and I’d have to walk away. But I learned a lot from her that winter. I learned a lot about me too; my limits, my frailties, my neediness too. It was often not pleasant to acknowledge. But there is mercy and grace for all of us, especially when we decide to love beyond measure, without return. In those places we find the end of ourselves and a return greater than we could ever give. In a fifty year relationship fraught with confusion, anger and unyielding suspicion, finally the walls came down. Sometimes we have to focus on what we have rather than what we don’t have. I hope some of what I have gained can be a blessing to you and I know there is more still to come. My heart’s desire is that this can be a place you can turn to for rest and encouragement in an often unpredictable, heartrending and exhausting season of life. Go easy on yourself, take time out to refuel. God’s grace is sufficient for you. • I picked up many books in hopes of learning how to better help my mom and tame my frustration. There was nothing that came close to the impact that this book had on me and consequently my brothers and our families. This book should be a must-read for those in the medical field as well. Good for help in dealing with anyone in any stage of dementia and/or Alzheimer’s. • This is the fifth edition of this book and gives an exhaustive bounty of information within this topic. I did not read the whole thing. However it is a good book to have on hand for practical information and includes everything from medical issues to help for the caregiver to considerations when looking for long term care. A great reference! ***Check this web site for local support groups and local chapters. The one near me had a library, videos and they were very helpful. I attended a couple of support groups. It’s good to know you’re not the only one who’s tired! Mom loved this, well most days. And I really loved dropping her off. It was a great place run by loving, compassionate people. There are good nursing homes. We found one, a small one five minutes from my brother in NY, run by the Daughters of the British Empire, whoever they are. 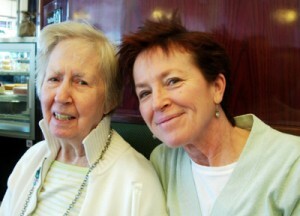 Mom is in their dementia unit where she is well-cared for and seems content. My brothers see her every week and we pay a lovely woman from my brother’s church to see mom weekly for walks, talks and just hanging out. Yes, I felt guilty sending her away. It was awful and it was hard. But after six months I was worn out and feeling sub-human. Unlike a toddler, mom would never learn and grow. Folks with dementia generally get worse. I listened in support groups as spouses made the most painful decisions of their lives. Whatever you decide, I salute your courage and your love. Only God’s love is perfect but this kind of love comes close.